Squeeze BKF onto wet surface or damp sponge. Rotate trigger spray nozzle to the ON position. 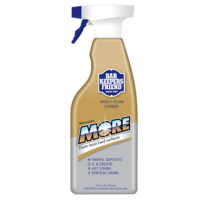 Select spray/mist (flap open) or spray/foam (flap closed) setting. Spray BKF on soiled surface from a distance of 6 to 8 inches. Rub area thoroughly with a cloth or sponge. Rinse or wipe dry within one minute. Apply foam and let stand for one minute. Because our Spray & Foam is acidic, BKF may etch or dull delicate surfaces. Before applying to fiberglass, plastics, anodized aluminum or brushed metal surfaces, such as appliance exteriors, test in a small, hidden area first. 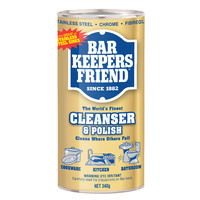 Sprinkle BKF onto a wet sponge or surface. 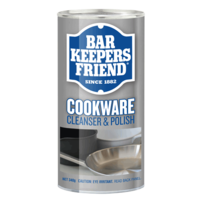 Because our Cookware Cleanser & Polish is acidic and contains polishing compounds, BKF may etch or dull delicate surfaces. Before applying to fiberglass, plastics, anodized aluminum or brushed metal surfaces, such as appliance exteriors, test in a small, hidden area first. 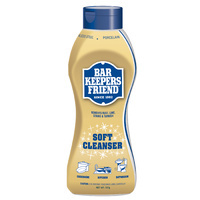 Squeeze BKF onto a wet surface or damp sponge. 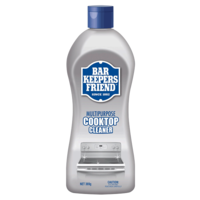 Because our Cooktop Cleaner is acidic and contains polishing compounds, BKF may etch or dull delicate surfaces. Before applying to fiberglass, plastics, anodized aluminum or brushed metal surfaces, such as appliance exteriors, test in a small, hidden area first.